Carla Murphy caught up with journalist, author, and now reality television host (“I’ll Try Anything Once”) Touré over the holidays. Of course she’d have preferred to have challenged him to some mildly absurd athletic contest to throw him off the question game (like Touré did over hoops when he interviewed Prince), but alas had to match wits via email. 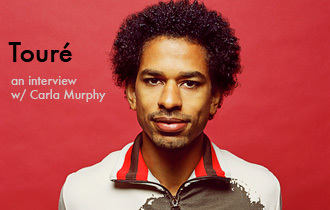 Murphy and Touré discuss surviving prep school, the future of hip hop, and Presidential contender (and as of this posting Iowa caucus winner) Senator Barack Obama.